Place an appliance thermometer in your refrigerator and freezer. If you have any additional refrigerators or freezers (in the garage, basement, etc. ), stick one in each of those too. This will make it easy to get an accurate temperature reading during and after any power outages. Keep your refrigerator and freezer full. A full freezer will maintain a safe temperature twice as long as a half empty freezer. Keep your refrigerator and freezer closed as much as possible. If you have food in your pantry that you can eat, use that instead of refrigerated or frozen foods. 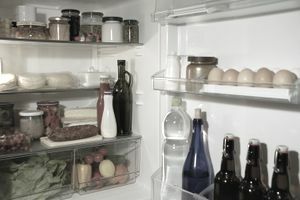 An unopened refrigerator will keep foods at a safe temperature for around four hours; an unopened freezer will keep foods safe for around 48 hours, if full; 24 hours if half-full. If your power is out for an extended period of time (i.e. longer than the times mentioned in step 3), you can keep foods safe longer by adding dry ice or bagged ice to your refrigerator and freezer. Fifty pounds of dry ice should keep an 18-cubic foot freezer at a safe temperature for an additional two days (and it's something that many grocery stores sell). Use your thermometers to verify that you're maintaining a safe temperature, and add ice as needed. Check the temperature in your refrigerator and freezer. Your refrigerator needs to be at or below 40 degrees F, and your freezer needs to be at or below 0 degrees F.
Any meat, fish or eggs that may have been stored at a temperature higher than 40 degrees for a period of two hours or more needs to be thrown out. Other foods may also need to be thrown out. Refer to the USDA chart, "When to Save and When to Throw It Out" for help in deciding what's safe to keep. *Scroll to the bottom of the USDA webpage for the chart. If you live in an area that's prone to power outages, consider investing in a generator, so your refrigerator and freezer don't lose power. Keep an inventory of your freezer on hand, so you'll be able to tell your insurance agent what you lost if you need to make a claim.